So, I’m not usually one for jumping on bandwagons but the satisfaction I get from using products up is, quite frankly, too good not to share! 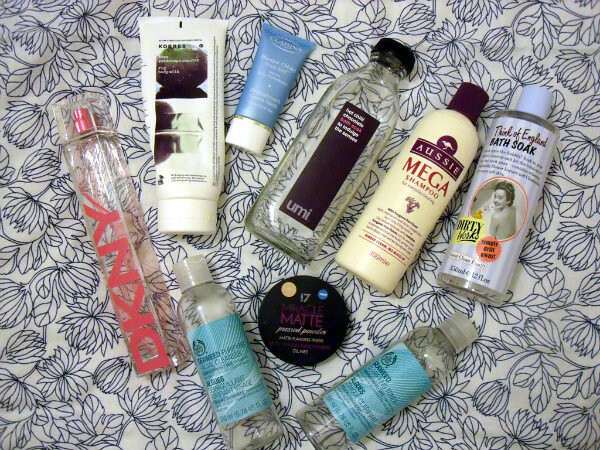 So here is my first little edition of empties, I doubt I'll be doing one of these every month, so ill just pop them up here and there when I feel I've accumulated enough ‘empties’ to warrant a post! DKNY Summer Woman* - This was, hands down, my favourite summer perfume this year, it was so light and fresh it really brightened my mood. I was happy I used it all up just in time to make way for my more spicy winter scents, but this is something I will definitley keep in mind for next summer! Korres Fig Body Lotion - I absolutely loved this, it pained me to finish it up as I never ever wanted it to run out. It smells gorgeous and left my skin feeling like silk. This is right at the very top of my Christmas Wishlist this year and if any of you were looking for a nice stocking filler for someone then I would recommend this! Clarins HydraQuench Cream-Mask (mini) - I don’t need to worry about using this one up as I have another three just waiting to be used (thanks to my boyfriends mum being such a die hard Clarins fan). This is my favourite face mask, especially in the winter months when a mixture of chilly weather and central heating leaves my face dull and dry. Umi Hot Chilli Chocolate Bath Soak - I picked this up waaaay back at the start of the year when it was on special in a local supermarket and to me, it sums up the smell of winter. Just a small drop of this in your bath fills your home with the spicy rich scent of winter and transforms a mundane bath into a bubbly festive treat! Aussie Mega Shampoo - This surprised me actually, I never really expect much from a shampoo. I usually rely on conditioners or oils to really make a difference to my hair but after using this it’s totally changed my opinion on the power of the humble shampoo. I will definitely be re-purchasing this one! Think of England Bath Soak - I picked this up in Sainsbury’s when I needed something to keep at my boyfriends house for bath-time and I love it. It’s basically just a copy (if not slightly cheaper) of Soap and Glory. From the sweet scent to the packaging, this didn’t change my life, but it is something I’d pick up again. The Body Shop Seaweed Purifying Cleanser - When I first got this I loved it. The gel like formula and purifying effect really help me keep my oily skin in check. However after continually using this, it really started to feel to harsh for my skin and had an almost stripping effect, which was sad as I really did like it. This isn’t something i’d go for again, but I would recommend this for anyone who has really oily or problematic skin as it does really give a deep down treatment. 17 Miracle Matte Pressed Powder - Lets get one thing straight here, I’m a Rimmel Stay Matte girl through and through, but my mum picked this up for me when I was having a make-up emergency one day. I have to say I’ve re-purchased this, it gives a much softer finish to the skin and looks really natural. On my ‘no make-up’ make-up days, this is definitely what I reach for. The Body Shop Seaweed Purifying Toner - The same really applies for this as it did with the cleanser, after using it for a while it just became far too harsh on my skin. Pheeew, that was a bit long winded eh? Well I’m very pleased with myself for using all these goodies up, and there are definitley a few bits in here that i’ll be going back to. What have you guys been using up recently?